Other Products by Optimum Nutrition. Search other Protein Powder products. Most Popular Whey Protein Powder in the World! Optimum Nutrition Whey Protein is the number 1 selling protein in the world. This product is one of the few award-winning supplements known for its broad flavour range. This means less boredom and more enjoyment with your regular whey protein shakes. This product is a blend of predominantly Whey Protein Isolates, Ultra filtered Whey Protein Concentrates and even Hydrolysed Whey Protein Isolates. Whey Protein Isolates are considered some of the cleanest and most rapidly absorbing proteins in the world, which is why they are used in Optimum Nutrition Whey Protein. This process delivers a very high percentage protein that also contains high levels of Branched Chain Amino Acids (BCAAs). Research has determined that BCAA’s are some of the key amino acids involved in the synthesis of muscle protein and recovery. BCAA’s are also utilised heavily as an energy source during exercise. "Whey Protein" generally refers to either a whey protein concentrate or isolate. Ultra filtered Whey Protein Concentrates utilised in Optimum Nutrition 100% Whey Gold Standard 4.5kg also delivers a high percentage of protein by weight at 80%, but slightly less than Whey Protein Isolate, at 90% protein by weight. This quality protein source has had much of the fat and lactose removed. Whey Protein Concentrates however contain many advantages over other forms of whey, particularly the bioactive compounds such as a-Lactalbumin, Immunoglobulim G, Bovine Serum and Lactoferrin. Each of these bioactive compounds has its own unique biological properties that can have a positive effect on improving immunity and intestinal health. Optimum Nutrition Whey Protein also combines Whey Peptides with the above protein sources. Whey Peptides are partially broken down through a process of hydrolysis resulting in an even faster absorbing protein. Is Gold Standard Whey Protein Good for Muscle Building? 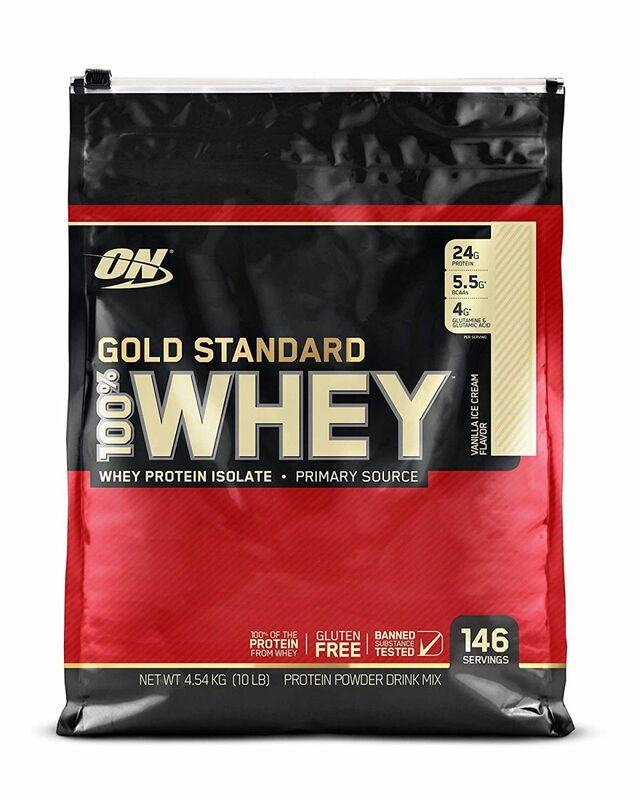 Optimum Nutrition 100% Whey Gold Standard 4.5kg is an effective protein to be consumed both before and after training, as well as between meals. Gold Standard 100% Whey is ideal for strength athletes looking to support muscle growth and recovery, endurance athletes to support recovery and even those looking to maintain a lean physique. It is important to remember that protein can only help your body adapt to the type of training that you engage in. For instance, if you undertake bodybuilding-style training frequently, this product will certainly assist with muscular adaptation, leading to lean muscular growth. Is Gold Standard 100% Whey Protein a Meal Replacement? This product is not specifically designed as a meal replacement. All good Meal replacements have added micronutrients, like vitamins and minerals, as well as fibre and often a small amount of carbohydrates to maintain blood sugar levels. Some even have added phytochemicals and probiotics. Meal Replacements are designed this way to mimic the nutrition of a quality meal, as closely as possible, yet without the excess energy or calories. 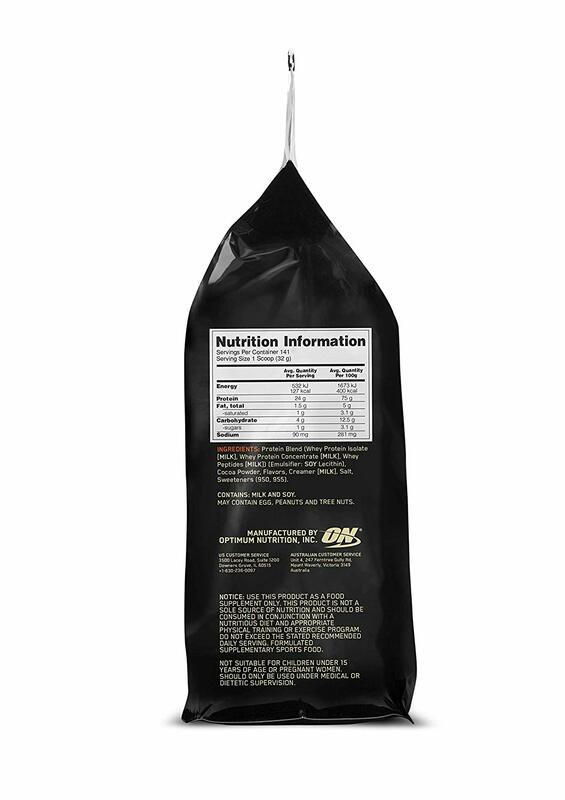 Though Optimum Nutrition Whey Protein is not classified as a Meal Replacement, for short-term use it may be used to replace 1 meal per day, as long as 2 quality meals are consumed daily, along with 2 healthy snacks. Does Gold Standard Whey Protein Come with a Scoop? Does Gold Standard Whey Protein Make You Gain Weight? 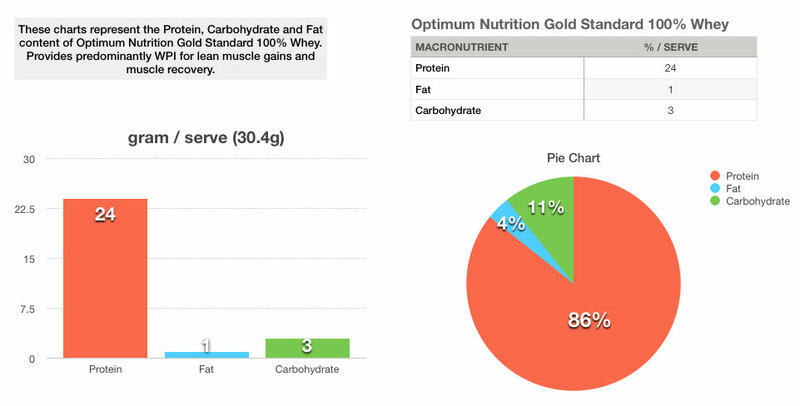 Optimum Nutrition 100% Whey Gold Standard 4.5kg is low in carbohydrates, sugars and fats, making it low in calories. Given this, it is highly unlikely that this product will lead to weight gain. However, as muscle is heavier than fat, if you are engaging in weight-bearing exercise or have not been eating enough quality protein for some time, you make notice some lean muscle mass gains if you use this product daily over a few months. Though you won't feel or look heavy, you may notice that you put on a small amount of weight, which is actually a good thing! 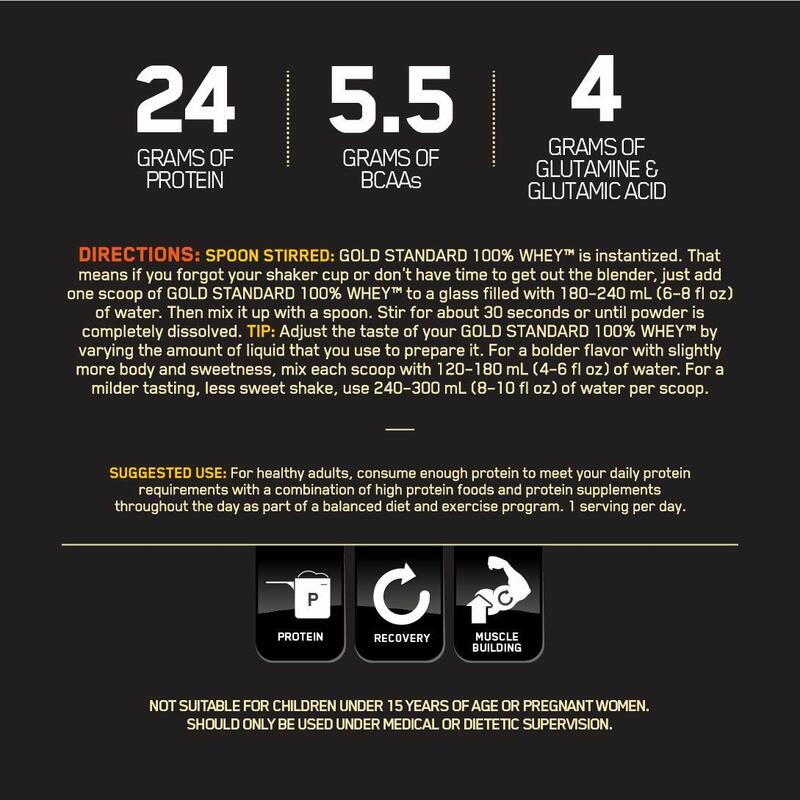 Mix 1 rounded scoop of Gold Standard 100% Whey to 175 - 240ml cold water or liquid of your choice and shake. Consume immediately post-workout. Additonal serves may be used to meet you daily protein requirements. If you want the BEST TASTING protein powder, then this is for you. It tastes just like a chocolate milkshake - it has no aftertaste and mixes quickly with milk or water. It has a high amount of quality protein and almost no carbohydrates...an excellent choice if you're looking to lose fat while increasing / maintaining muscle. There's no cramps, farts or other unwanted side-effects when you take this protein and it leaves you feeling full and satisfied. Best of all, the 4.7 kilogram bag is great value for money! Each serve works out to cost about $1. Great taste, great quality and great value - what more do you want? INGREDIENTS: Protein Blend (Whey Protein Isolate [Milk], Whey Protein Concentrate [Milk], Whey Peptides [Milk])(Emulsifier: SOY Lecithin), Cocoa Powder, Flavours, Creamer [Milk], Salt, Sweeteners (950, 955). 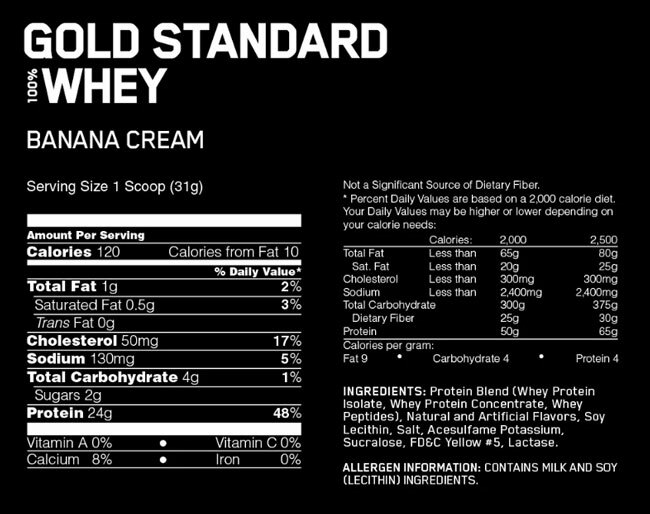 What Flavours does Gold Standard 100% Whey Protein 4.5kg Come in? Vanilla Ice Cream, Extreme Milk Chocolate, Double Rich Chocolate, Rocky Road, Cookie and Cream, Strawberry and Banana Cream.